I would like to extend my gratitude to the wonderful staff of STONEFLY PRESS for offering me the opportunity to read and review The 50 Best Tailwaters to Fly Fish for the readers of True North Trout. The most difficult part of opening this great book was resisting the temptation to skim over the early chapters on The WEST and dig in to the depth of the ROCKIES and the EAST sections of some of the best Tailwaters across the country. I was very thankful I didn’t skip over the first chapter otherwise I might not realize the great fishing we have in Arizona and New Mexico. Being from the Great Lake State, it is easy to take for granted the amount of freshwater we have and the free flowing, spring fed rivers that thread their way through our countryside. I never really understood nor looked at the significant impact some of these great reservoirs have on regional fly fishing. These large bottom drawn spillways offer a consistent temperature that are more than suitable for trout and many macro-invertebrates for a healthy ecosystem. This was not the case for many of these fisheries a few decades ago. Some of them were warm water rivers, but after multiple efforts, conservation authorities re-evaluated the resource and started stocking trout, aquatic insects and crustaceans(scuds and crayfish). This was a winning combination for many sections of flowing waters that rarely exceed 50 degrees year around. At first glance, I was very impressed with the great photography, clear and concise maps that denote campgrounds and nearby towns. Familiar faces and names in places that I have come to know through social media, make this read feel warm and comfortable, much like my favorite Simms zip up fleece. Names like Mike Mercer, John & Amy Hazel, Jon Kleis, Tim Tollett, Joe Demalderis, Jeff Lewatowski, Kevin Feenstra, Bob Mallard, Ben Levin, Tim & Joanne Linehan, Craig Matthews and a slew of others have all contributed their knowledge of local waters and numerous days on the river to assist in adding a better experience to your trip. Wendy and Terry Gunn open their book up with a brief description of this rewarding project and how difficult it was to choose only 50 tailwater rivers. Each Chapter also includes a list of guides/outfitters, where to stay, whether at a campground or a hotel, as well as eat and get a good drink. A nice addition you wouldn’t see a decade ago in a book like this is reference to cell phone coverage on the river and closest medical resources. Each chapter describes where to fish, what flies to use and what type of rod to bring to prepare you for the best fishing. 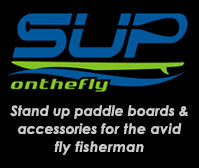 Crystal clear waters on most of these waters require 9-15 foot leaders, often 6 or 7 X, and micro flies in sizes #20-28. Bring your A-game and get ready for some fun. Most don’t see much dry fly action, so Zebra Midges, RS2’s and WD40’s trailing behind Cressbugs or Girdle bugs. A keen eye and sensitive touch will improve your catch rate. As always, check with your local fly shop, hire a guide for the day and learn the water quicker and better than aimlessly pulling over and casting alongside the the road where the path might be well worn from a horde of others before you. I really appreciate how each river within the designated region referred to local guides and utilized their knowledge of the best times of year to fish and what to expect on the water during your day. It was also refreshing to see fellow bloggers Kent Klewein from Gink and Gasoline actually on the sticks on his homewaters of the South Holston River with David Grossman of Southern Culture on the Fly. Tailwaters can fluctuate in flow more in a day than many rivers see in a season due to water release from the need of electricity demand at the source. Be careful if you are wading these waters for the first time. It is not recommended to go alone, do not take chances and wade beyond your limit. I have only been out west once, to Colorado, when we looked at re-locating to the front range. I had the opportunity to fish some of the rivers near Estes Park and got a taste of what significant fisheries like the Big Thompson River have to offer. Before going, I read a few ‘Where-to and How-to Fish‘ the Rockies books, getting a taste of what awesome fishing there was within hours of our cabin near Lyons, CO. I made the mistake of quoting my personal Bucket List, and only mentioning five states that I would like to fish before I ‘Buy the Farm’. 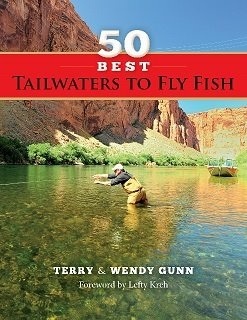 My wife mentioned the other night, that through books like this and the many other connections I have made through the love of fly fishing, I should make my own personal “Best Rivers to Fly Fish List” and we should plan to hit one of those destinations each year as a family vacation. This book is a great starting point and highly recommend purchasing your own copy for the angler in your life. This would be a welcome addition to any fly fishing library. Perhaps a perfect Christmas Gift and you can begin your very own Bucket List of places to visit and fish. Brian, Thanks for the great book review. My wife just asked what I wanted for Xmas and I think you discovered it for me. The idea of having a contact with “boots on the ground” is great. Happy Thanksgiving and know that your posts are appreciated. Weekend Special Edition: Best Places to Fly Fish | Fly Fishing Blog Blog: Searching the internet Daily for the Best of the Fly Fishing Blogs!